Detail From: Jansson, Jan, 1588–1664. Copperplate map, with added color, 42 × 52 cm. According to an August 20, 2010 article in Britain's Daily Mail, "Men clock up an average 276 miles a year aimlessly driving around lost rather than asking for directions." And women drivers, despite a million jokes about men being too proud to ask for directions, don't fare much better, averaging 256 miles a year aimlessly spinning their wheels. All of which seem to indicate that even with the advent of GPS technology, a good old-fashioned map, and the ability to read it, still comes in handy. Cartouche From: Jansson, Jan, 1588–1664. The road maps we use today, whether digital or on paper, are strictly utilitarian. We glance at them only long enough to figure out how to get from "point a" to "point b." But there was a time when the map was an object of beauty, and a work of art. 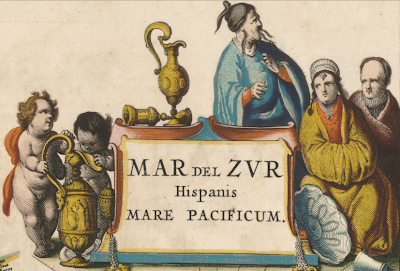 Princeton University's Historic Maps Collection and Firestone Library Department of Rare Books and Special Collections have combined forces to create three exquisite online exhibits centered around maps from the Age of Discovery, roughly the early 1400's through the late 1600's. These exhibits contain a wealth of information about the exploration of the Pacific Ocean, The African Continent, and North America. 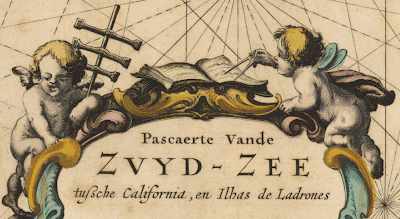 There's an embarrassment of riches here, so this article concentrates on only one intriguing aspect of the maps: their ornamentation and embellishment. Cartouche From: Blaeu, Willem Janszoon, 1571-1638. "Regiones Sub Polo Arctico" [ca. 1638]. handcolored, with French text on verso. The word "cartouche" has its origins in Egyptian hieroglyphics, but to Europeans it meant a paper encasement, coffin, or scroll, often bound with a rope. The term is used in everything from armaments to architecture, but in cartography it is any decoration on a map that is self-contained. This frame with a decorative border may contain the map's title, its scale, a dedication, the printer's address, and/or the date of the map's publication. 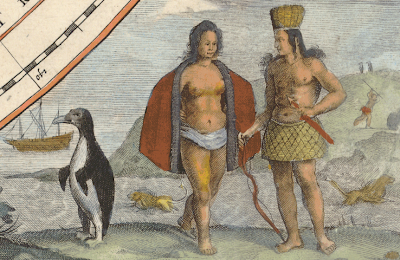 The cartouche depicted here is from a map containing the major English discoveries of Henry Hudson and William Baffin, as well as those within Hudson Bay of Thomas Button and Thomas James. The images surrounding it include a cannibal enjoying a tasty snack, and a European cooking his own food, who may represent Hudson after he was cast adrift by mutineers. Detail From: Blaeu, Willem Janszoon, 1571-1638. This is a vignette, with a cartouche within. In the vignette figures, flora, and fauna leave their frame and blend into the map. Here the fanciful, wolf-like creature atop the scale is intended to be a polar bear. 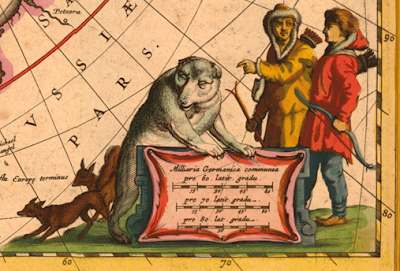 Map makers sometimes relied on modest sketches or verbal descriptions to create their versions of the strange creatures encountered by explorers. Other times they added animals they were familiar with, whether or not they could actually be found in the location depicted on the map. Copperplate carte à figures map, with added color, 35 x 45 cm. 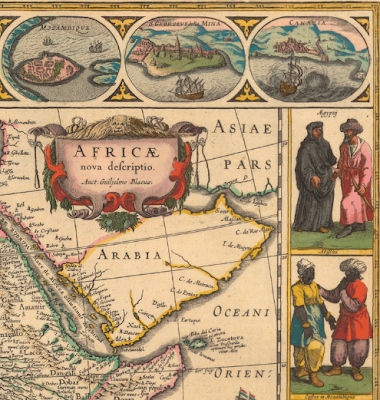 This border is from one of the most accomplished and popular early maps of Africa. Its fine engraving and calligraphy, ornate cartouches, delicate hand coloring, and exquisite pictorial detailing all mark it as one of the most artful maps ever produced. It was first issued in 1630, and reprinted repeatedly in Latin, French, German, Dutch, and Spanish atlases as late as 1667. 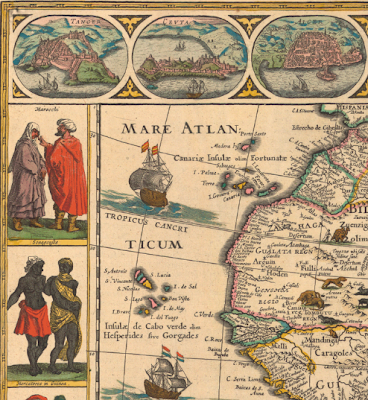 Another section of Willem Blaeu's map of Africa, which was drawn in a format called carte a figures. 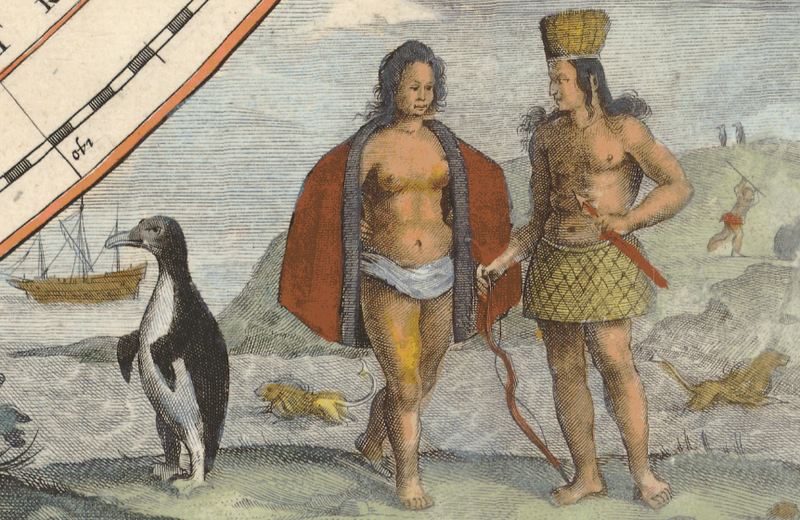 Its decorative border contains meticulous renderings of native costumes from each of the coastal nations depicted. The oval panels contain views of major port cities and their landmarks. A wide variety of animal life decorates the map's interior, including lions, elephants, ostriches, and flying fish. set within a larger pictorial framework. (Paris, 1852). This map, first published in 1845, is a cartographic failure but a decorative delight. Considering its relatively late publication, the map is singularly lacking in geographic detail. Its lavish decoration makes it a throwback to an earlier age of elaborately embellished cartography. 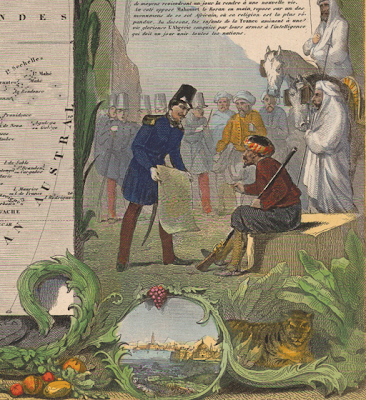 In the section above, a French officer presents what may be some form of treaty to an armed Arab, as both Westerners and natives look on with concern. The detailed depiction of fruits, flowers, animals, and landscape vignettes mark this as one of the last great decorative maps ever produced. Detail From: Hondius, Hendrik, 1597–1651. 44 cm. in diameter on sheet 44 × 50 cm. (Amsterdam, 1638). 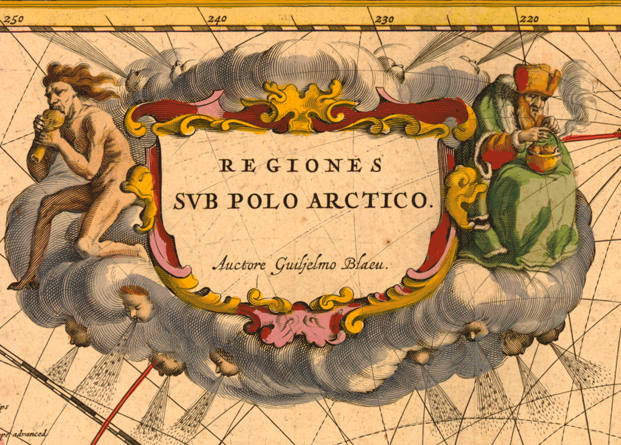 As the geographical accuracy of cartography progressed, the ornamental and decorative aspects slid further and further off the map. Soon, today's functional but uninspiring maps became the norm, perhaps leading us to spend less time consulting them, and more time pretending we have understood their meaning. If the data we got from Mapquest was beautifully illustrated, would we more quickly grasp the content, and spend less of those fuel inefficient hours proudly taking pointless journeys down the road to nowhere? Or would we become so intrigued by the likenesses of the plants, animals, and people inhabiting place we are trying to reach, that we might never arrive at our destination at all? Great post! 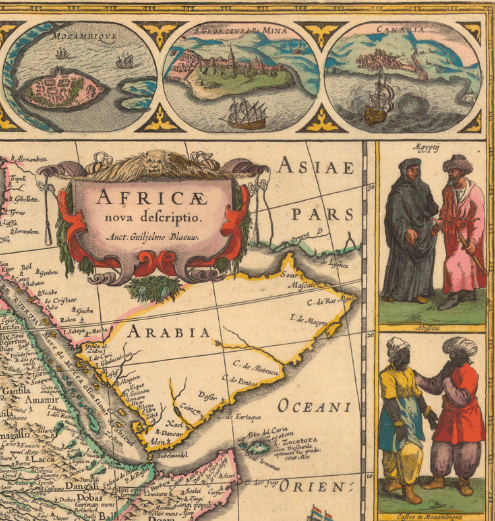 Maps are fascinating, especially the old ones. They are indeed art work! Very nice explanation of map terms of decorations. It might be mentioned that the Dutch, as with so many cartographic innovations. began the decorated map.